Laguna Water now provides desludging services | Manila Water Company, Inc. Besides providing reliable and potable water supply 24/7, Laguna Water recently expanded its services to include desludging or used water siphoning services for its customers. Since the desludging services began in the third quarter of this year, more than 240 households have already been visited and inspected. 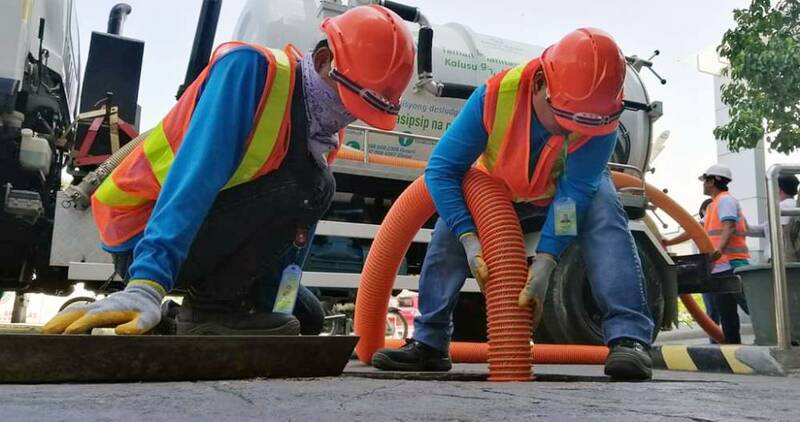 A total of 40 customers have been provided with the service with an accumulated 77 cubic meters of septage collected and treated at Laguna Technopark Inc. Sewage and Septage Treatment Plant (LTI SSTP). Around 100,000 households or 500,000 residents in Binan, Sta. Rosa and Cabuyao are set to benefit from the implementation of the said sanitation efforts. Septage or used water collected from septic tanks will be collected and hauled by Laguna Water’s desludging trucks to the company’s sewage and septage treatment plant where it will undergo stringent treatment processes to comply with the strict pollution standards of the Department of Environment and Natural Resources. Treated used water or effluent must be Class C Standard to ensure that used water discharged to natural bodies of water is safe for aquatic life. In 2014, Laguna Water acquired and operated the used water treatment plant of Laguna Technopark, Inc., one of the largest industrial zones in the Philippines. In April of this year, Laguna Water upgraded the treatment plant to include a fully-mechanized septage treatment facility. Now, the LTI Sewage and Septage Treatment Plant has an increased capacity to treat 11 million liters per day (MLD) from the original 7 MLD of used water produced by various companies and locators in Laguna Technopark. The upgrade has allowed the processing of 70 cubic meters of used water from establishments and households in the abovementioned areas in Laguna. LTI Sewage and Septage Treatment Plant also boasts of the use Food Chain Reactor Technology (FCR), which is a first in the Philippines. Provided by Organica Water, a global leader in providing used water solutions, FCR utilizes more than 3,000 species of aerobic bacteria that thrive on plant roots and engineered patented biofiber media to treat used water. This initiative is part of Laguna Water’s Tamang Sanitasyon Equals Kalusugan, Kalinisan, at Kaunlaran ng Bayan (TSEK ng Bayan). Launched in April of this year, the program centers on environmental services, such as sewage management, desludging, collection, transport and treatment of septage. It is the company’s share in responding to environmental challenges including the fast-rising pollution of Laguna Lake. Laguna Water General Manager and Chief Operating Officer Shoebe Caong shared that regular desludging of septic tank is everyone’s responsibility in protecting the environment to prevent further pollution of water bodies while promoting health and sanitation of communities. The company has laid out a five-year desludging schedule to ensure that all its customers will be provided with the service. “We, in Laguna Water, are steadfast in our commitment to environmental protection and we believe that we can create significant impact through effective collaboration with the government and the communities”, added Caong. Laguna Water is a public private partnership between Manila Water Philippine Ventures and the Provincial Government of Laguna.